Thy next foe is... An alter overlooks the lake... A guardian set loose... It keeps the flames alive. 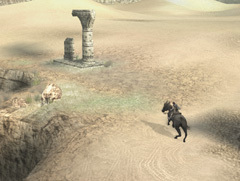 The 11th colossus hides very far in the north of the forbidden lands. To reach it (and to ride somewhere else this time and use another route) you exit the temple and ride to the back of the temple (north) on the east side of the temple. On the northeastern end of the mountain plateau you and the temple are on is another natural bridge you can enter via a small set of stairs. 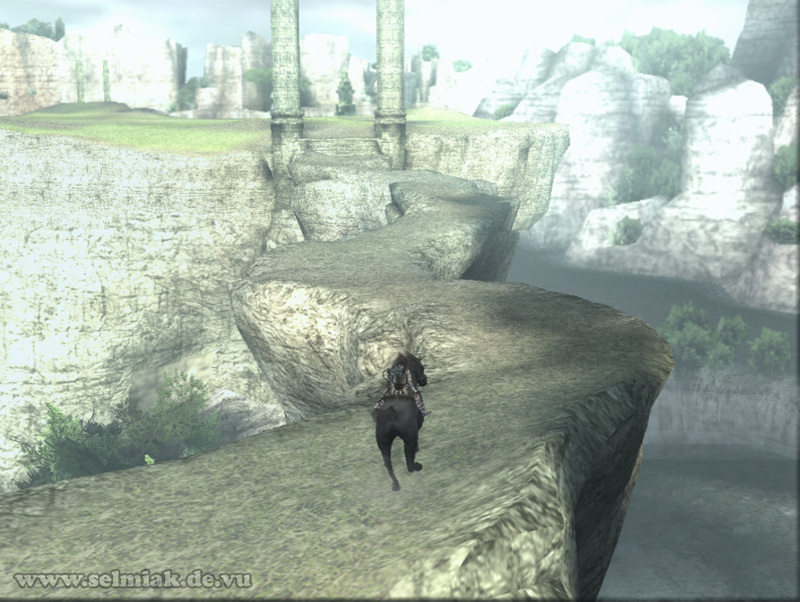 After this just mentioned natural bridge you just keep on riding towards the huge manmade bridge towering all over the land and follow the bridge straight to the north until you finally reach another cliff/hole in the ground after some time. Get to the most eastern point of this cliff/hole in the ground and find a long and narrow path winding down to the bottom of the hole. Leave Agro up here and get on this way down there. Getting down there with Agro is quite impossible and also very useless as there is water at the lower end of the narrow path which Agro wouldn't cross anyways. Well, if you have little time you can also jump down into the cold water without hurting yourself all that much. Now swim through the water and cross the canyon to the west towards the huge stone bridge to get access to the temple like underground system. Walk all the way up the hill and then enter to the left. Here you have to jump over a small gap to the east to reach the 11th colossus. Hold on tight on the other side, climb up and face him. This wild bull is very annoying and hard to come by. But this shouldn't scare you off from trying (and dying by trying) because that's what you are here for. 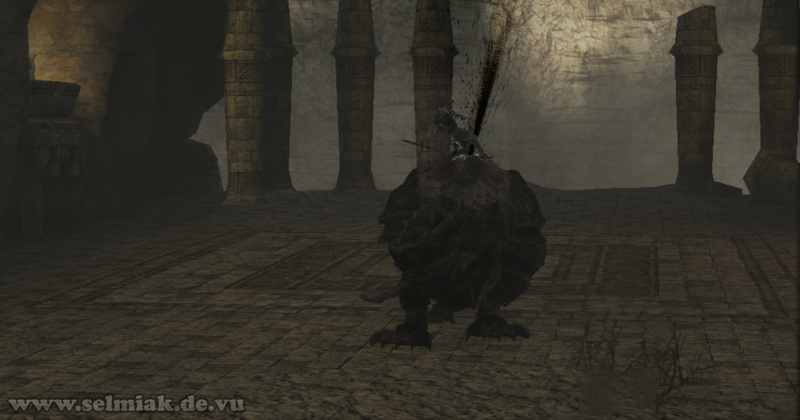 The eleventh colossus has 2 attacks, one is to just run towards you and knock you off your feet, which will throw you to the ground and keep you dazzled for some long seconds and then he will just ram into you again and so on and so on until you are done. Luckily sometimes you have a few parts of a second where you can run away from the continuous attacks or you can roll away to the side. Then you have to be fast and hide in one of the crevasses. 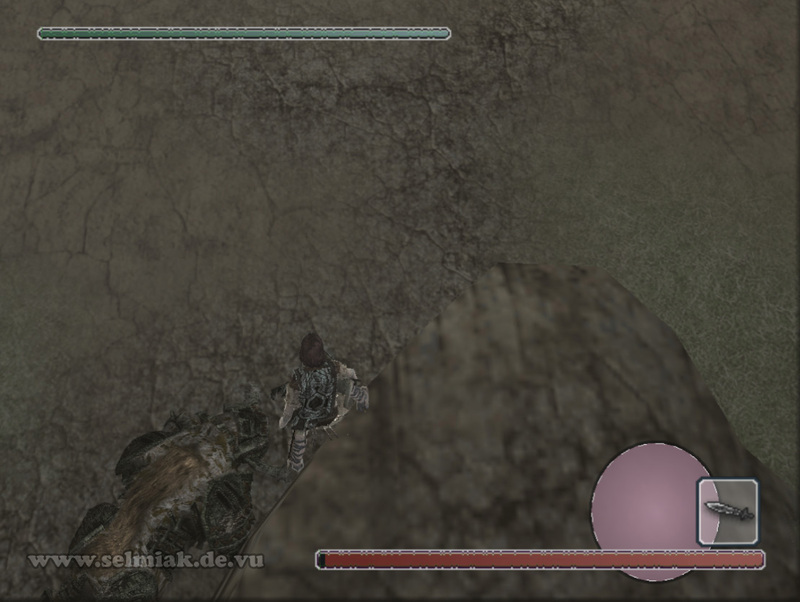 So once you are hiding in one of the crevasses he uses his second attack. He tries to hit you with his claws and hurt you badly with them. This takes away a bit more than the ramming attack but is easier to avoid by just hiding deeper and deeper inside the crevasse. 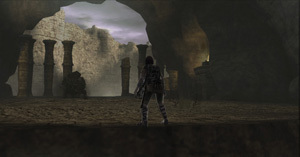 Now that you know what awaits you with the 11th colossus we now come to the important part of this solution, which is how to defeat the 11th colossus. 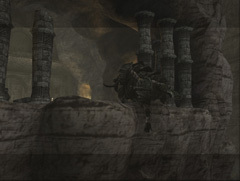 You have to find your way into one of the crevasses between the walls of the cave and the pillars with the fire on top. You are always close to being hit while you make your way into there. While you are finally inside the crevasse the eleventh colossus will try to hurt you with his claws as I already mentioned, but just don't be impressed and climb onto the pillar without being hit. As soon as you are on top of the pillar the colossus will start to hammer his head into the pillar and look at this, a burning stick will drop down from the fire and land on the flat ground near the colossus. 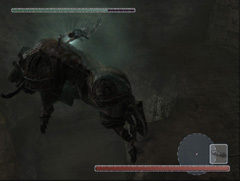 In the exact moment when the colossus gains momentum to hammer his head into the pillar again you jump over the eleventh colossus and after the stick and pick it up by pressing or . Once you are holding the stick in your hands climb back up on the pillar and set the stick on fire by hitting the fire with the stick (with the or the button). 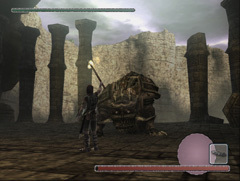 Jump down and get in front of the colossus with the burning stick in your hand and hold it up high like you normally hold up your sword to let the sun reflect from it to show you the way. 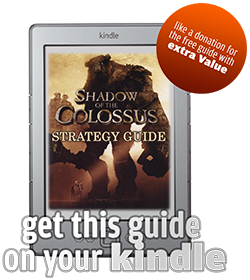 The colossus finally shows the deserved respect and slowly walks away from you backwards. 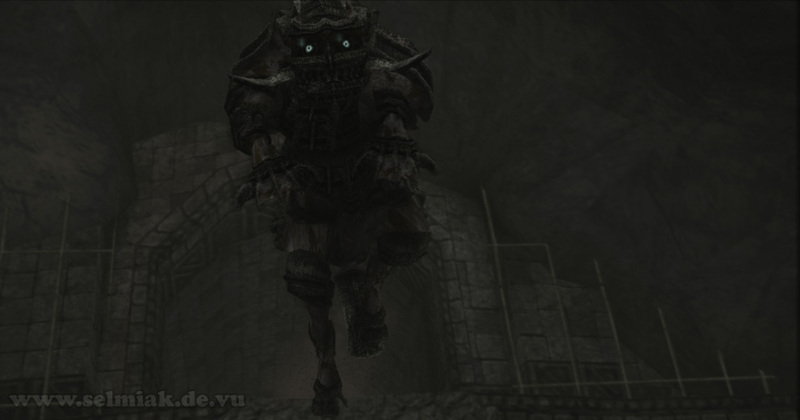 And so you now hustle the 11th colossus towards the eastern end of the cave (opposite of the site you came in) until he loses his grip and drops down. 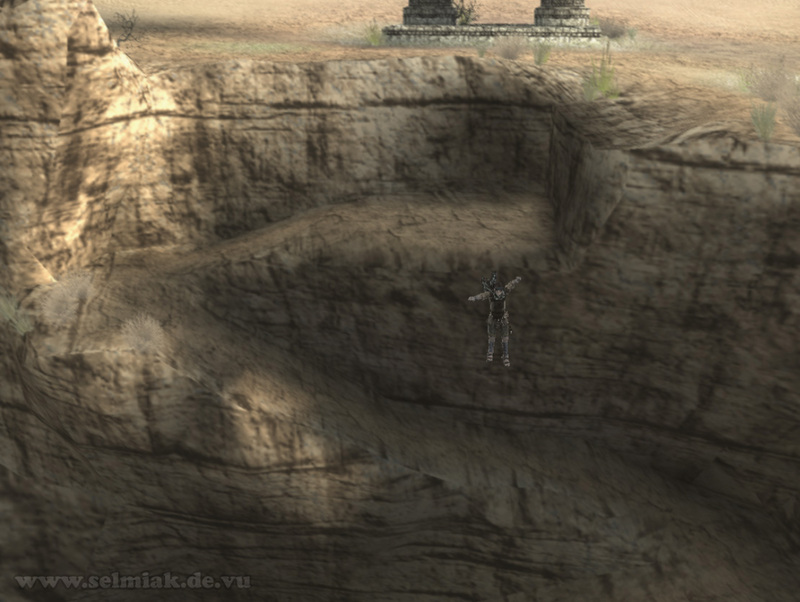 And of course you drop yourself over the edge and after him and land one level down. 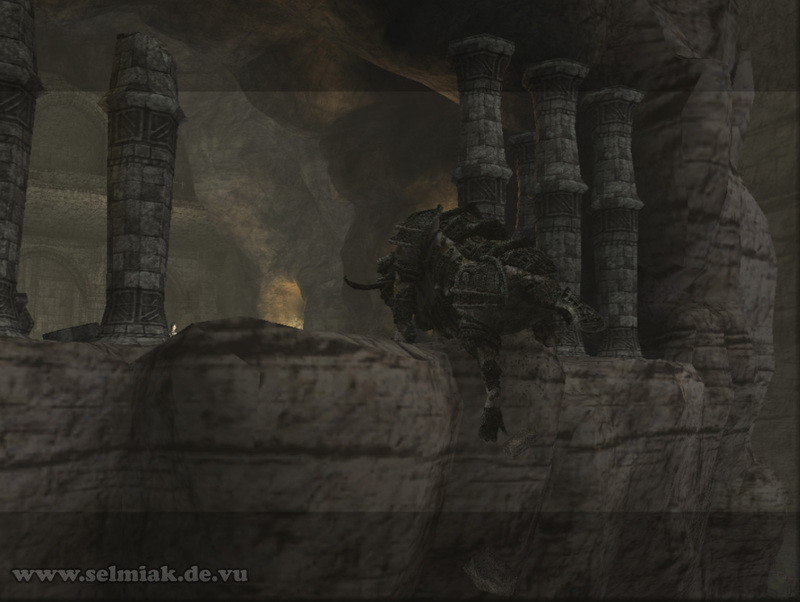 The 11th colossus is still located one floor lower, so take a look over the next edge and aim for his back. 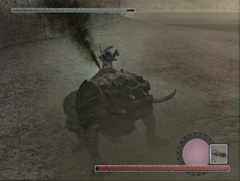 With a little bit of skill you manage to land on the back of the eleventh colossus and can also strike a jump sting onto his now open back that is no longer shielded by an armor. The thing with the jump sting nearly never works, but hey, the colossus is dazed and you can take you time to aim. But even if the jump sting fails you should really land on his back and hold on tight. Otherwise you have to get onto his back now, and this can become really annoying. If you didn't directly land on the colossus' back you are now unshielded in front of the eleventh colossus and have to find a way back onto his back somehow. 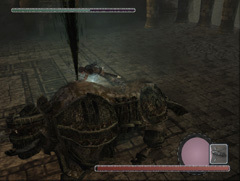 So what do you do beside dodging his attacks by rolling away? 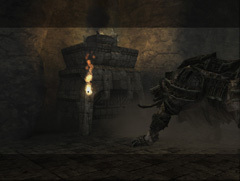 You run around him (as soon as you are standing safely again) and jump over his tail onto his back. 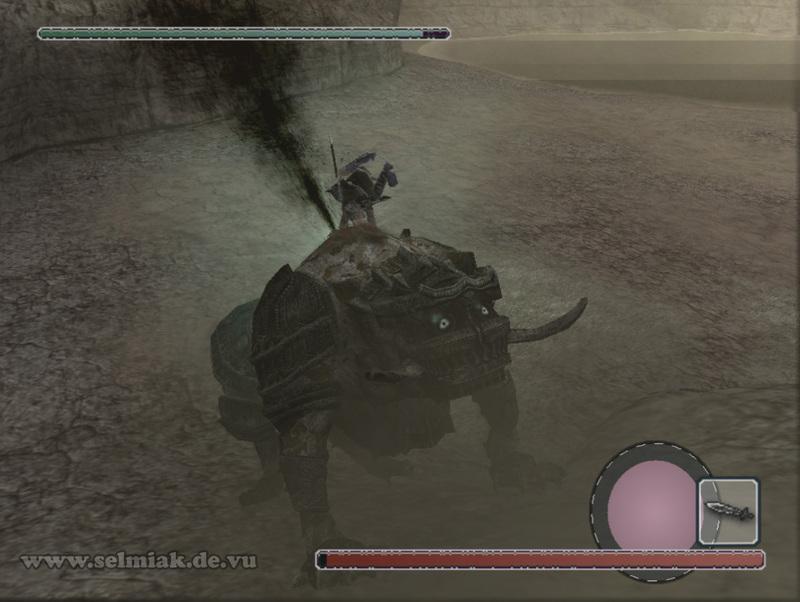 This might take some tries but as soon as you are standing behind the 11th colossus he cannot ram into you anymore. And if you are fast and skilled enough you can turn with him and then there will be a time where you can grab onto his back. This is really annoying and frustrating but it is doable. Once you are on the back of the eleventh colossus again there is only a small time frame for you to strike a blow into his weak point so use it wise and unforgiving. After some more or less joyful time of running and chasing around in the open area the colossus will return to his home cave, the temple area with the four fires, and here you can stay on one of the fireplaces and regain health and then jump on his back from one of the pillars. Now you can take him out bit by bit. As always you only have a small timeframe shortly after the stopping (after running) and before he shakes. 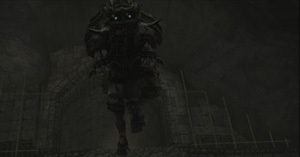 After the shaking and before running again the timeframe is not enough to charge your sting and smash it into the 11th colossus. 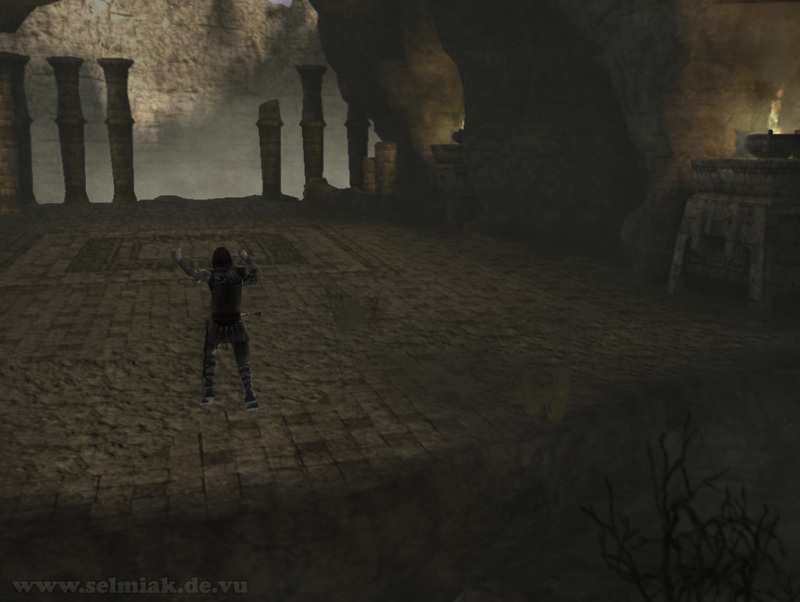 But it is possible, even though hard, to jump after the shaking and before the running and then smash a jump sting ( + at the same time) into his weakpoint. If you manage to pull this off you will drain his health by a lot! This is also very useful on time attack games. 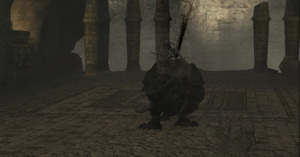 Also the farther away from his head you hold on to his back the less affected you are from his shaking, so climb down a bit on his short back and get away from his head and shoulders to have a longer time window for charging your sword blow. Maybe it even helps to position yourself in a 90° angle to his walk direction on his back. If all else fails kill it with fire. Light up the stick again and make him fall over the edge again. Once he fell down again he is dazed again and you can jump sting into his weak spot. Do this often enough and you will also get him down some time. 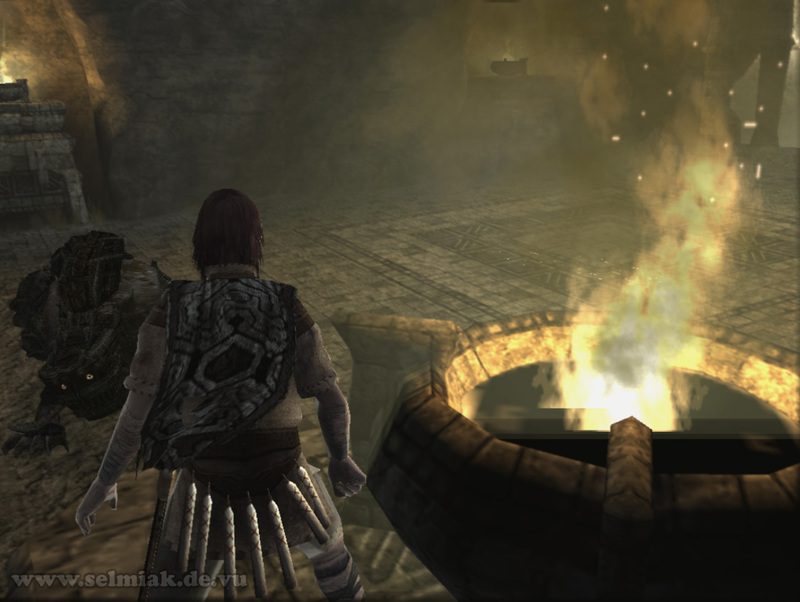 As it is easier to jump onto him from the fire pillars you can also push him over the edge the first time shoot a waking arrow into his back and just wait for him to return to the fires and kill him off there if this makes it easier for you.